I have recently been making regular appearances on the GearGeeksLive podcast with Tony and Andrew. Tony and I recently had Thomas Welk from KAI (Kershaw/Zero Tolerance) on the air for an episode about KAI. I found it fascinating to get inside the head of a prominent representative of a major cutlery company. One part of the show that really stuck with me was Thomas’ point that many knives are designed to fit into boxes. And no, I’m not talking about those fancy cardboard wrappers we have all come to know and love. I’m talking about MSRP. Most knives coming out of high volume manufacturers are designed around a price point, because these large knife manufacturers work with major retailers and these major retailers put manufacturers under tremendous pressure to deliver product at certain price points. If a manufacturer decides to base their business around working with large retailers, then this can make up a large part of their bottom line. Ultimately, the point Thomas was making is that production knife making is usually a study of compromise, oftentimes to the chagrin of enthusiasts like you and me. Not every knife coming out of KAI’s doors can be a 0888. Hell, they can’t even just produce the 0560. Instead, these companies must appeal to a broad range of consumers with a varied budget. This is why we see everything from a $250 Zero Tolerance 0560, to a $25 Kershaw Cryo. ‘Tis the nature of the big production house beast. And then we have the 0566, which fits in between the 0560 and the Cryo – both in size and in MSRP ($180 – $150 at retail). More interesting is that the 3 blades share a Rick Hinderer design pedigree, and loosely resemble his coveted XM series of folding knives. This time around Zero Tolerance has tried to appeal to the persnickity middle market, attempting to tow the fine line between high end and high value. As I am sure Thomas will tell you, that isn’t always easy. I see the 0566 as a real exercise in compromise. There is a certain danger to trying to make everyone happy, and the goal of my review is to determine whether ZT struck a sweet spot, or pissed everyone off. 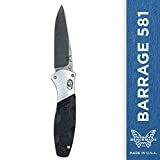 The 0566 has an overall length of 7.7″, has a 3.25″ blade, and weighs 5.3 ounces. While substantially smaller than my 0560 it only weighs .7 ounces less. This is due to the stainless steel frame lock and full steel liner. Depending on your perspective, the knife either feels “substantial” or “heavy”. Thomas talks on the podcast about how some consumers equate weight with quality. I’m not sure I am one of those customers. Weight issues aside, I like this size for a robust EDC or, for lack of a better phrase, folding tactical knife. The size compares favorably to classics like the Benchmade Griptilian and Spyderco Paramilitary 2. 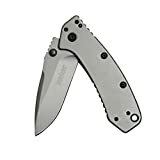 The blade shape is classic Hinderer drop point and looks identical to the 0560. Mine was ground evenly, came with a very rough stonewash, and came from a fairly thick piece of Elmax steel. The blade geometry is middle of the road. You aren’t going to win any cutting competitions with this knife, but it’s sturdy and will hold up well under regular and sustained use. It’s not nearly as thin as my Volli, but then few production folders in my collection are. Elmax steel and Zero Tolerance is a pairing not without its controversies. People have said that ZT jacked up the heat treat on some of the earlier Elmax knives or burned the edges in the final sharpening. I did not find that to be the case on my 0566. I went through my usual favorite cutting demonstrations, which included working through sections of 3/8″ and 1/2″ manilla rope and some commercial grade cardboard. The Elmax held up well. It continued to hold a good edge, and when it was all said and done sharpened back up easily with stops and a fine Spyderco Sharpmaker stone. The only thing to note, was that after a period of hard cutting I would get a little lock stick with the steel framelock. Nothing I couldn’t pop open with one hand, but definitely note worthy. The lock stick went away after I disengaged the lock. Although the shape of the 0566’s handle mirrors the 0560, ZT definitely approached it with a $180.00 MSRP box in mind. You have flat peel ply G10 over a full stainless steel liner, pillar construction, and a solid steel frame lock. It’s a far cry from the 3D machined scales of the 0560 with swiss-cheesed liner and pocketed titanium frame, but it’s still a sturdy and well made handle. ZT went with relatively beefy hardware and finished everything nicely. Everything lines up well, and the pieces are cut out clean and crisp, while the edges of the handle are all nicely broken and comfortable to hold. While this isn’t cutting edge tech found in ZT’s higher end offerings, it’s still a well made handle. Ergonomically you have a relatively thick and comfortable handle. The jimping, which is the biggest problem with the 0560 because it is so hellaciously sharp, has been fully addressed on this model. There is still some jimping, but it has been flattened out to reduce the chances of slicing your thumb open on an aggressive cut. The flipper tab limits your grip options, but the knife holds nicely in forward and reverse grips. The pocket clip is an enlarged version of the clip found on the Cryo. It’s a black deep carry style clip. It works well, and offers the user discrete deep pocket carry. It’s a 4 position clip, which is appropriate on this user/tool grade knife. Thomas points out that pocket clips are the hardest part of the knife to design as you will always piss someone off regardless of the design, and they are one of the most expensive parts of the knife to manufacture. All things considered I think they did a good job with this clip. I often wonder if dedicating an entire paragraph to “deployment” is worth my time and your attention, but with the 0566 at least there is some interesting stuff to talk about. The knife comes assisted with Ken Onion’s speed safe mechanism. What is interesting is that the 0566 also comes with a ball detent. Thomas said that ZT did that purposely so that the user could de-assist the knife if they wanted to. He stated that it would not perform as well as something like the 0560, which is fully designed to be a manual knife, because the combination of spring tension and a strong detent would make the knife very difficult to open with the spring in. The assisted opening was snappy and there wasn’t any annoying torsion bar rattle like on most other speedsafe knives I’ve reviewed, but being a fan of manual action knives I took the speed safe torsion bar out early on in the review process. It took a little fiddling to get the blade centering and deployment to play nicely together, and my blade still heavily favors the G10 side (although it does not rub). But that is OK, as I understand the knife wasn’t designed to be a manual flipper. All things considered, the flipping action is actually pretty good on this knife, especially after an application of tuf-glide and a break in period. Don’t expect Spyderco Domino level performance, but if you preload and “push button” (as opposed to pulling back on the flipper like flicking a light switch) the flipper the blade pops out nicely. This knife uses phosphor washers, and they are really smooth. I am actually pretty happy with the manual action on this knife. Lockup on the 0566 is solid and without play in any direction. You would expect that out of a 5.0+ ounce knife with a stainless steel lock bar. It met my expectations. Lockbar disengagement was nice and easy, and as I mentioned previously, I didn’t notice any blade stick unless I was using the knife hard. The 0566 is a pretty good tool knife. If you were like everyone else I spoke with, and liked the 0560 but found it to be too big, the 0566 might be a good choice. That is of course just as long as you aren’t expecting an actual mini 0560. Practically speaking, the 0566 checks many boxes. It’s a comfortable knife, and it cuts well enough. I have to say that it is heavy. If I had to give it a number rating, I’d go with maybe a 6.5 out of 10. Not a bad knife, but far from perfect. I could live without a bearing system and 3-d machined handles, but would have really loved to see KAI make the jump from stainless steel to titanium framelock on this model. While I like the 0566 alright, I don’t think it will make as many waves as the 0560 or the Cryo. A danger with being too middle of the road is that you risk getting ignored. I don’t doubt that ZT will be able to move some product, as it is drafting off of the wildly popular relationship KAI and Rick Hinderer have formed, but whether it will remain as memorable (or infamous) as some of the other KAI/Hinder collabs remains to be seen. As a businessman myself I don’t have a problem with companies making money, but I must admit the enthusiast inside of me would have loved to see just a little more here. 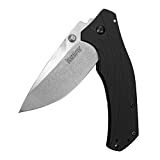 I think that a ZT/Hinderer collab with a ~3″ blade and most of the high end fixings would do really well, regardless of the MSRP. 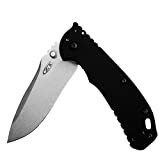 I recommend purchasing the ZT 0566 at Amazon or BladeHQ. Please consider that purchasing anything through any of the links on this website helps support BladeReviews.com, and keeps the site going. As always, any and all support is greatly appreciated. Thank you very much.